Digital disruption has impacted almost every type of business in the recent times. The real estate sector is also not untouched from fast pace technological changes. Both commercial and residential real estate need to adapt to the digital disruption. The business model of real estate companies in Australia has not changed since a long time. Most real estate agencies offer similar services. Therefore, customers are not able to distinguish between them. Most agencies work with middleman. Most real estate providers own physical offices for which they pay exorbitant rents. In their attempt to recover it, they charge their clients huge commissions. Most of these shortcomings can be trounced by innovating digitization. However, the real estate sector is a customer service industry both from the property management and the sales perspective. A digital platform cannot cater to service industry directly. 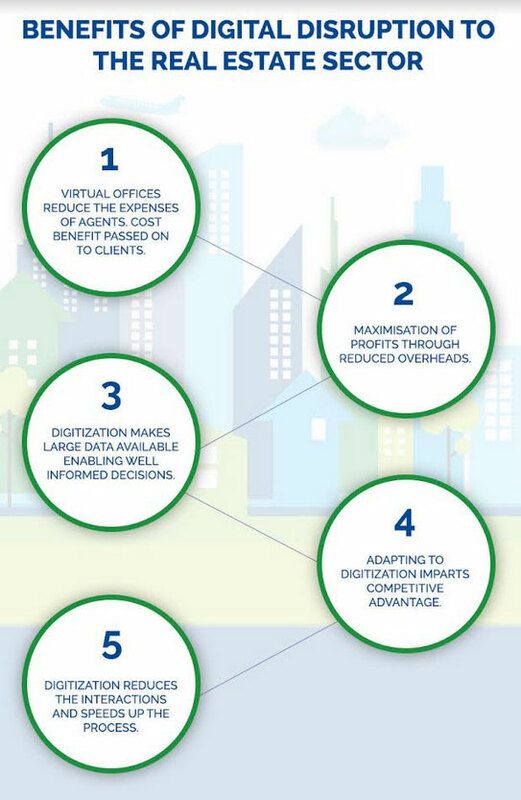 But the real estate market has utilised various aspects of digitalization for its benefit. Properties can now be listed; photographs and videos are uploaded, enabling the seller to sell without an agent. 1. The internet has made it possible for real estate offices to operate in virtual space. If they do not use physical offices, they don’t need to pay any rent. They can pass on this benefit to their clients in terms of reduced commissions. 2. It helps in reducing costs and maximising profits. 3. It helps in taking well-informed decisions. 4. A real estate agency that adapts to these changes will definitely have a competitive advantage. 5. The current real estate market involves numerous interactions with multiple service providers and institutions. Digitization will reduce the interactions and speedup the process. In Australia, various real estate agencies are understanding the benefits. 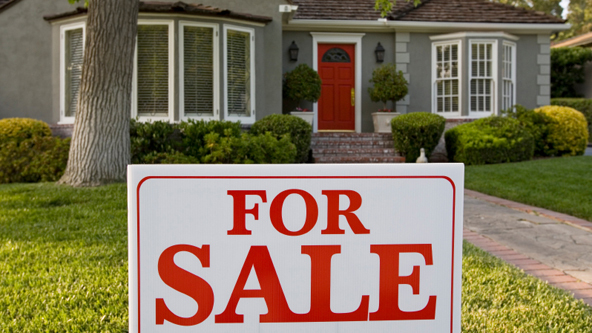 Therefore, the trend in real estate selling has changed from selling through an agent to assisted property selling. This type of selling enables the property owner to sell his property with the help of professional services without paying a commission. One such agency that has innovated with disruption in the real estate market is RJR assist. RJR assist has moved away from the traditional concept of charging commission from its clients. We charge a fixed nominal fee. We have introduced a concept of assisted selling. In this case, the property owner has the complete control on the process of sales but we allocate an agent to assist through the process. 1. The owner shares his details with RJR Assist. An agent is allocated who remains with the client until the end of the sale. 2. The property is evaluated by our experts. 3. The agent gets the property photographed by a professional at no extra charges. He also prepares a floor plan and description. 4. After this, the property is advertised on leading property websites such as realestate.com.au, domain.com.au, etc. 5. They agent arranges properties for potential buyers. Our agents are available 24/7, so appointments can be fixed at any time. We ensure to get the best price for your property. 6. Our agents will help you in all the documentation of the sales process. You can sit back and relax and our agent will work for you! 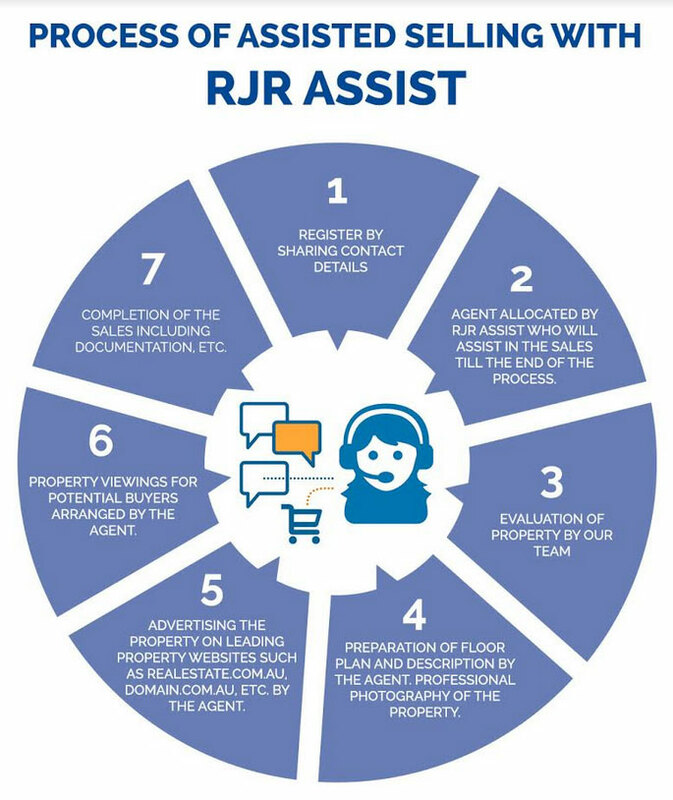 RJR Assist enables you to sell your property with best of services and assure to give you the maximum revenue.